Track Listing: 1. Spirit (45:00) / 2. Epilogue (11:00) / Bonus track: 3. Spirit (Single Edit). 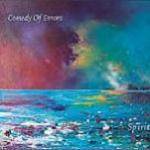 More information: The new album 'Spirit' represents a step forward in the band's development dealing with themes of grief, loss and ultimately, hope. The CD release features the 45 minute part 1 Spirit track, the part 2 Epilogue track and in addition a Spirit (single edit) bonus track. Highly recommended Prog!